There’s a loose music here, and a subtle drift across the page that enacts the movement between seasons, the flow of the river, and the speaker’s own motion across and through country. ‘Indigenous space’, however deeply meant, may be too vague a phrase to work, even as a late-poem register shift, within a network of highly blended specific and concrete images. This dissipates the particularity that is built up throughout the poem. Hall might benefit from trusting his readers (and his work) to find connections in the dense network of image that he otherwise capably handles. There’s a similar awkwardness in ‘Palimpsest’, a poem that seems to have been back-engineered from the final line (or the title). 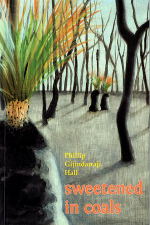 The most effective image in this poem is one that enacts what the poem does rather than what Hall tries to wrestle it into: ‘the Budawang Range / is a complex / of pricked and folded gullies / embellished with monoliths’; showing us the physical, geological folding of Dithol (Pigeon House Mountain) and also suggesting its cultural erasure more subtly than the poem’s sudden but obvious coda, ‘- palimpsest’. The notion of culture and place as palimpsest runs consistently through Sweetened in Coals. This speaks to Hall’s recurrent concern with the ongoing impact of colonisation in Australia. In the poem that follows ‘Palimpsest’, ‘Promised Land’, country is persistently written over by ‘timber getters’ and the early twentieth century bushwalking club, the Warrigals, ‘surveying / Their wilderness – a canvas pitched / over the Dharug’s stone hearth glow.’ It’s vital to note here that the Warrigals’ picturesque ‘wilderness’ simultaneously reimagines country that is already home to a people – the Dharug – and also covers it over, extinguishing the interaction between place and culture that makes country. It’s a dark irony that Hall must use place names assigned by the timber getters and Warrigals in order for his speaker to explore it. In doing so, he layers – or coalesces – concepts of and perspectives on the nature of place, derived from a multi-layered range of sources: Indigenous cultures, his own walking through country, colonial and ecological perspectives. 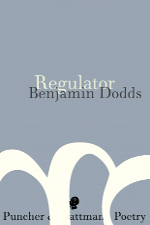 This entry was posted in BOOK REVIEWS and tagged Benjamin Dodds, Greg McLaren, Phillip Gijindarraji Hall. Bookmark the permalink.